I'm so tired of hearing people tell me I should lose weight if I still want a boyfriend or to get married or have babies etc. etc. etc. Most of these people are well-meaning, but really guys, is that a way to build someone up or transform a girl into a desperate wreck with hardly an ounce of self-worth? So, to combat such sayings and (mostly unsolicited) opinions, I've decided to start making these feel-good motivational photo quotes to keep you up top and remind you of what a beauty you are, no matter your size. I know what you mean. I have been "okay" in terms of body weight for all of my life, but then i ballooned up after I had four operations. It has been a struggle to shed off unwanted weight. It also doesn't help that I hear snickers from skinny girls, but I say to myself always that they don't know my what i've been through and that i am a strong woman! People tend to judge so easily when they know so little. You are an inspiration to women everywhere! I agree with you. I have also been told by a lot of people to lose weight so that I'd look prettier and that a guy can actually be attracted to me. Now, I think that's a very twisted way to look at things. I think I'm perfectly fine, and although I really am on a journey to losing weight, it is because of some health problems I needed to deal with not for vanity's purpose. I have a good and stable job which entails me to do my passion, I'm exclusively dating a guy who has seen me beyond my physical features and I'm happy. It's not only us, plusies, who should learn about acceptance, but also the society. I agree completely. Good luck on your journey to better health! I totally agree with you. I find it offensive that people think women need to change themselves for men. Your weight is nobody's business but your own and your relationships with men are also no one else's business. I've never been told to lose weight but being an Asian with monolid eyes, I've been told I'd be much prettier if I got surgery to "fix them and make them bigger." I don't like the idea of changing my appearance to fit other people's view of beauty and it was extremely hurtful hearing things like that during my adolescence when girls are more sensitive to things like that. I do understand the feeling of being told to "fix yourself" if you want to get a boyfriend or whatever. I know what you mean. It's like people are convinced that if we change this part, or lose this part, THEN we'll be beautiful. It's just frustrating at times. I actually can't believe anyone would even say that to you, even if they don't mean for it to be offensive. It still is. I think you are beautiful and I know you will meet a man who sees that too. That's just sweet. Thanks Yi-chia! Like I've said in my own blog, you can't just judge someone on just their weight or size alone. We are sadly a society that favors beauty over than personality. 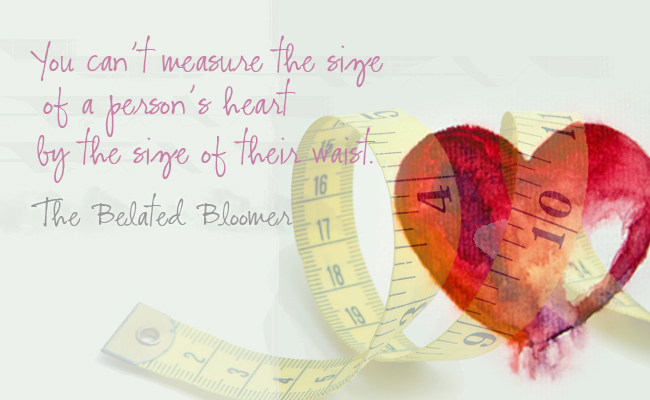 Too bad not as many people can look within others rather than focus exclusively on one's weight/size to judge people. Unfortunately, we're a very superficial species. I love the quote and I like the message behind your post. I am somewhat a small girl but I sufffer from the big jiggly thigh syndrome and big hips for the rest of my size. It is hard to cope when your family is the one who tells you that you are "fat in the arms and thighs" when you never even thought it about yourself. After a certain time of being told this by family, you truly start to believe it. In my opinion true beauty is within the body but asthetically I have always considered "thick" to be more woman, the true woman, than "bones. No offense to anyone, just my outlook!